This entry was posted in Documentation on March 25, 2012 by android cookbook. 3.4 version introduces the Dropbox synchronization. Dropbox is a file hosting service that allows to synchronize folders between several devices. 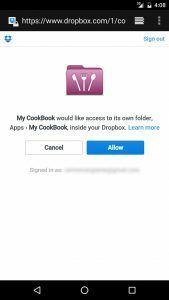 Linking MyCookBook to your Dropbox allows you to backup your recipes, to synchronize recipes between different devices, and to access your last 100 backup ! 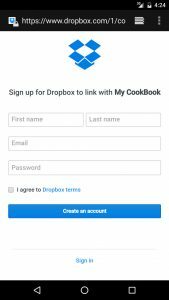 You only need to create a free Dropbox account to use the feature. In the action bar, select dropbox in the dropdown list. 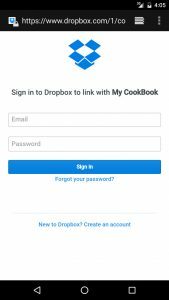 You access the dropbox website and you can login to an existing account. Or you need to create a free account. 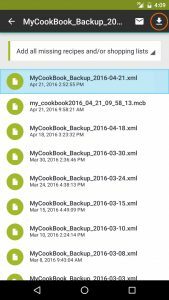 Once My CookBook is linked to your Dropbox account you can see your files on your dropbox account. The export button in the action bar will save all your recipes into your Dropbox. If you select a file, the import button will allow your to import your file. I can’t see my recipes on my new device, I paid for it and I should be able to see them anywhere. Always duplicate important information, which you keep on Internet! Because it is the most unreliable place in the world. For example, I use two different apps for my recipes: this one (with backup options) + another, more like Internet site, I call it “Cooking Facebook”. Some just keep everything on PC or Pendrive. 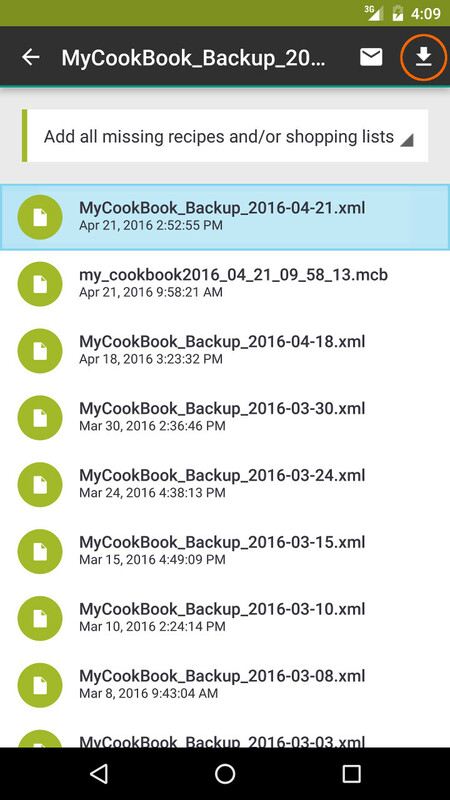 I previously was using the Android app and backing up all my recipes to Dropbox. Now, I just got an iPhone and downloaded my cookbook and set up an online account so I could sync my old phone with my new one and have all the recipes transfer over. However, the online account only allows for 100 recipes (even though it claims I have a free premium account for a month) – this is crazy! I have about 250 recipes and am always adding more. 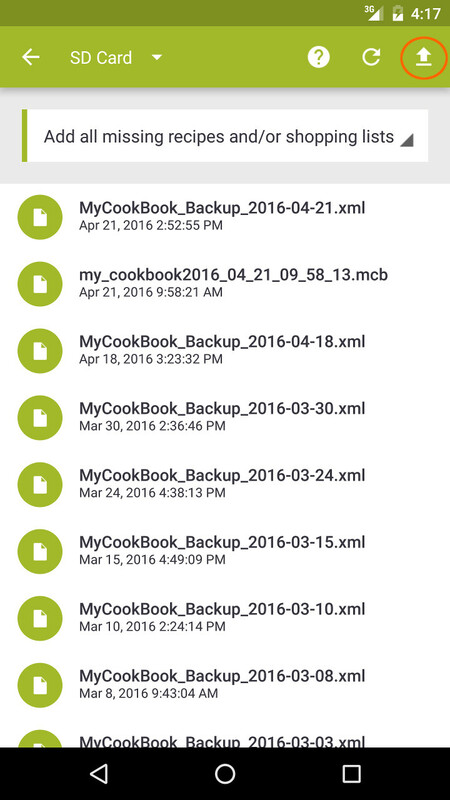 If I import my backup files from my old phone (with over 200 recipes) to my new phone will it override this 100 recipe limit? I love this app and I love all my recipes but I need more than 100!! Any help would be great! 24 hours after I posted this all my recipes magically synced to both the online account and my new phone! I assumed you guys did it! Ha, well thanks for looking for me. In order to keep the premium account how much will it cost? Thanks again! Also, just out of curiosity. 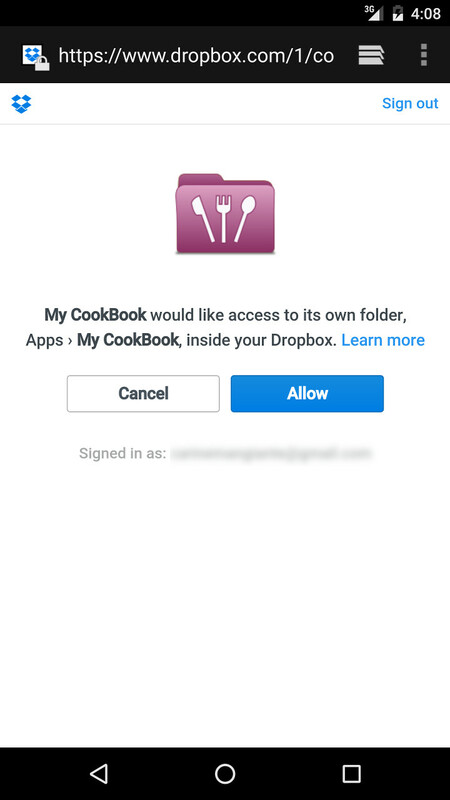 I noticed on the iphone app that the only import option is to “import from your digital cookbook”. So, am I not even to import from my Dropbox back up files at all anymore? Also also ☺️, I’m dying for a single page view (ingredients and recipes together on the same screen) that doesn’t involve having to unlock screen rotation and turn the phone sideways. When I do this the directions for into a view lines of text but the ingredients list is crazy long and I have to keep scrolling all the way down to see the ingredients and then all the way back up to see what to do with them. The single page vertical view I have on my Kindle fire is beautiful. Any way to get that on my 6s plus given that the screen is so large? 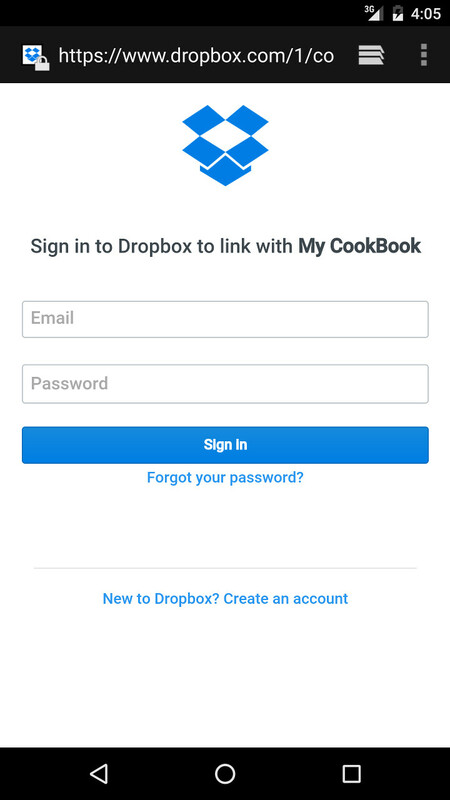 No dropbox is not supported on iOS … You can import your backup files here http://www.mycookbook-online.net/recipes/import/. Thanks for your suggestion, I’ll try to improve the iOS app. When I moved from My Cookbook to My Cookbook Pro, all my recipes moved fine. However, Pro will NOT connect to Dropbox. I have been through all your help screens and it tells me Dropbox will magically come up with the “let My Cookbook Pro” have permission. I cannot get to there. I can see older files saved from before “Pro”. I tried from Dropbox end, but cannot generate linking message. What happens to my ability to sync across devices?!? 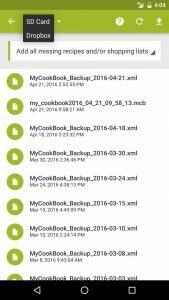 The recipes I loaded to Dropbox from my Kindle Fire (4th gen) imported to my Fire (3d gen) – – but NO pictures came with them. Is this a glitch or do I need to do something else? I have subscribed to the annual fee. Hi did you use the .mcb format when you have exported you recipes ? 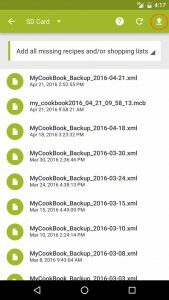 I exported all my recipes to Dropbox and manually did it as well. Both times all my recipes came through just no pictures. Please help. The pictures are in the zip file under images, it just won’t show up when i open my cookbook. My Dropbox is full and I won’t pay for more space. How can I sync workout Dropbox? 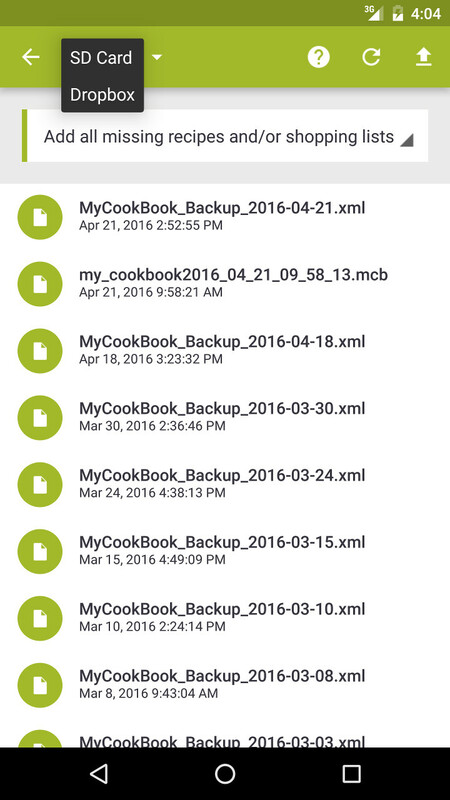 I have mycookbook pro on my Android phone (bought it). Can I also use it on my new ipad? Without buying anything? © 2012 - 2018 Maadinfo Services. All rights reserved.